THE REVENGERS , sinking like a stone in 1972, took William Holden and Ernest Borgnine, still basking in their glory from The Wild Bunch, added favorite Woody Strode, drew a farewell turn from an ailing Susan Hayward, had a script from clever veteran Wendell Mayes, and reins taken by likewise track-strong director Daniel Mann. 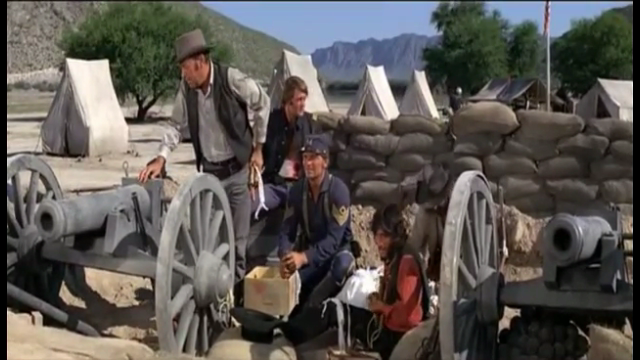 It mixed elements of The Wild Bunch, The Dirty Dozen, The Searchers, went to reliably rugged and scenic Durango, Mexico for the shoot. It all came out lousy. Mann’s direction is flabby, Ernie overacts like he’s about to have a heart attack, the tinny music score is all wrong, the cinematography is washed out, the action scenes are repetitive and absurd, the situations derivative and not at all believable. Holden wears the exact same costume he used in the Peckinpah classic. Critics waved it off, and it slunk into 74th place for the year, gnawing off $4,500,000. 106 minutes with nothing to offer beyond some personal second-hand memories from your humble reviewer. My late brother-in-law, Larry Pennell, was a co-star, and he regaled us with happy tales from the shoot. He adored William Holden. I met (briefly) Borgnine shortly after and he could not have been nicer, enthusiastically answering questions from a happy 18-year-old kid. For me, then, this spoiled turkey has some sentimental attachment, but I wouldn’t pitch it to anyone else beyond that. With Roger Hanin, Reinhard Kolldehoff, Jorge Martinez de Hoyos and Arthur Hunnicutt (bonus: met him, too, in an elevator! ).